The training takes place in the Terrasolid facilities in Leppävaara, Espoo, about 10 km from Helsinki City Center. The address is Upseerinkatu 1, 02600 Espoo. The Terrasolid Training room is located in the "Upseerin Avec" office building, main entrance of Tower 1, 2nd floor (next to restaurant "Tommi's kitchen". The name of the room is "Turku". 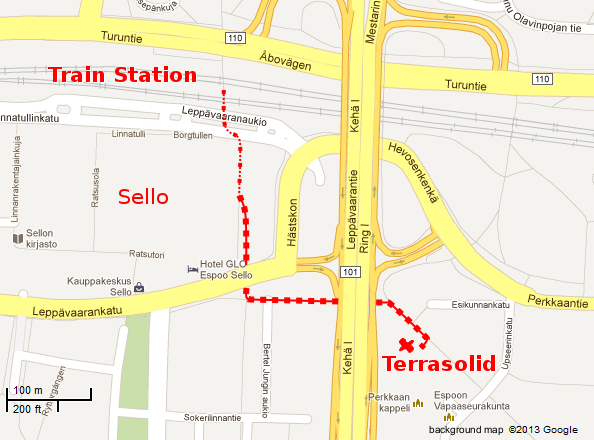 Terrasolid's training facilities are located about 500 meters from Leppävaara station. Whether you come by bus or train from Helsinki downtown or by bus from the airport, you will probably get off at Leppävaara station. When walking from Leppävaara Station, please follow the route marked on the map below. From the platform go downstairs into the tunnel and turn right. Follow the tunnel in the direction of "Perkkaa". After the tunnel, take the left alternative, pass under the road, and turn left. Follow the walkway between the buildings and under the motorway. Turn slightly to the right and go a few steps into the building complex ahead. The building on the left is Tower 1 ("Torni 1"). Go on a few more steps straight ahead to the middle of the building and enter through the roofed main entrance. Pass the reception desk and go up the round stairs to the second floor. Turn left, pass the glass door and turn left again to the entrance door of room "Turku". The airport is located in Helsinki Vantaa. From there, busses number 540 or 514 go directly to Leppävaara station. The bus ride takes about 20-40 minutes. Alternatively, you can take a taxi. The commuter trains A, E, U, S, Y, and L go directly from Helsinki Central Railway Station to Leppävaara. They usually leave from tracks 12-18 at Helsinki Central Railway Station. The trip to Leppävaara takes about 12 -15 minutes. Tickets are sold at ticket machines or in R-Kioski shops. Most of the ticket machines accept cards and coins for paying a ticket. Tickets for train rides must be purchased in advance. There are several busses going from Helsinki to Leppävaara. Helsinki itself has an extensive bus network as well as tram and metro lines. The Journey planner provided by Helsinki Region Transport (HSL) helps you with finding routes and time tables. Tickets for tram and metro rides must be purchased in advance from a ticket machine or in R-Kioski shops. Tickets for bus rides can also be purchased from the driver but the price is higher than for tickets purchased in advance. Unfortunately, there are no free parking space available for Terrasolid training participants. The nearby shopping center "Sello" has a parking garage offering 5 hours of free parking. The parking time is measured automatically and starts when you park your car. You can move your car out and in again in the lunch break of a training day. However, we recommend to use public transport instead of your own car. The nearest hotel is the Glo hotel in the shopping center "Sello" located about 350 m from the Terrasolid office. Another option in Leppävaara is the Hellsten Hotel & Apartments which is located about 1.3 km from the Terrasolid office. You can also choose from numerous hotels in the Helsinki City Center and commuter to Leppävaara for the training sessions. There are also multiple-day tickets available for using the public transport. There are many restaurants in the nearby shopping center "Sello", varying from fast food and sandwiches to ethnic menus and à la carte restaurants. At lunch time, most of the restaurants offer a buffet with several choices of warm food, salad, bread, and coffee or tea. More information can be found here.